Join my team over the next few months and learn how to grow your confidence and that of others. 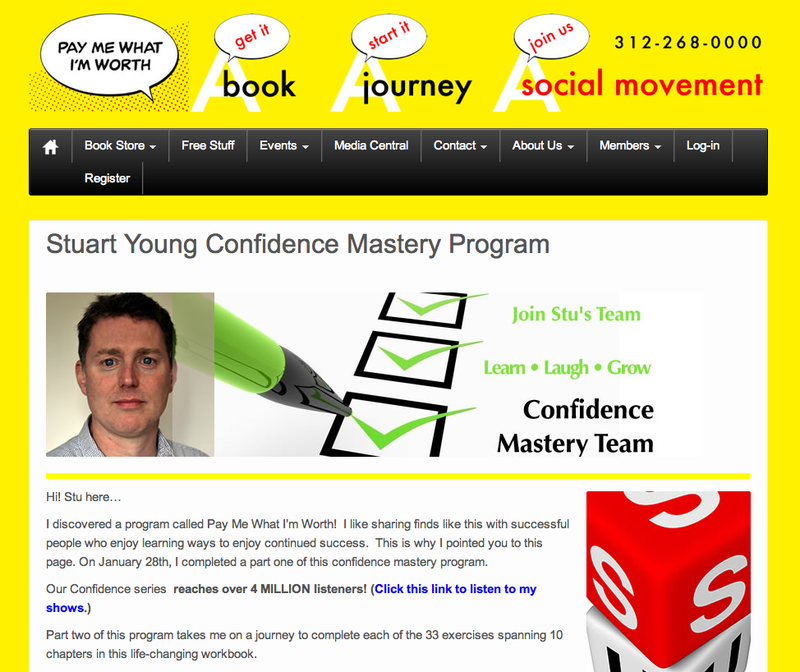 As some of you may know I have just completed the 1st part (12 weeks) of the online ‘Confidence Reality Series‘ Program. I was already pretty confident, but I wanted to find out ‘why’ – so I could ramp it up whenever I wanted or needed. What I actually discovered was a whole matrix of influences that effect our confidence levels, AND, we have multiple levels of confidence. We can be confident at work but not in relationships. We might be assertive with our kids but not with a car salesman etc. I learned a lot about myself and others during this last 3 months and it’s been a real eye opener on many occasions. I have been invited to co-create a Confidence Team with Soul the author of the book ‘Pay Me What I Am Worth‘, and host of the radio show. The Team will meet via Skype a set number of times per month to work through the various exercises in the book. I’ll also be applying my own teachings regarding mindset, gaining clarity, making decisions etc. into the mix. There’s a limited number of places so please, if you wish to improve your own confidence or simply learn where it comes from and what can make it disappear, OR if you want to help others with these issues – let me know asap. Up until this coming Friday there is a special offer available so let me know if you are interested and I’ll give you the full details. PS: To listen to the shows in the series go here and scroll down to the ‘On Demand Shows‘ panel. Doesn’t get clearer than that! I can’t embed this video – and it’ll only be available TODAY! Tony helps a guy that’s had a stutter for decades, to realise where it came from and how to eliminate it. Incredible video about how the power to change ourselves is within ourselves. The brilliant Vishen Lakhiani, co-founder of the innovative Mindvalley company, asks these insightful questions so you can really define what it is you really want from your life. Do this exercise as soon as possible, it take 4 and half minutes but could make a huge difference to the direction you take in 2013.
expert adj having or showing special skill or knowledge derived from training or experience. That’s how the dictionary in my home describes an expert. So, there seems to be a difference between what You think an expert is and what I might think an expert is. I’m sure when it comes to brain surgeons, lawyers, electricians etc. we would opt for fully qualified, certified people that have been trained. But their are many areas of knowledge where experience is equally important and maybe even more so than the training someone has had. Horse riding, running a successful business, innovating, inventing, selling – are all examples of endeavours where someone may be an expert without ANY formal training. So here are my questions… are You an expert that has or hasn’t had formal training? If so, do you teach others your knowledge? Do you value training over experience or vice versa? Is training useless without experience? Tony Robbins 9 minutes of Mindset brilliance! Take the opportunity today to help someone feel safe. Feeling safe is one of main fundamental drives along with food and shelter. So it’s not surprising what effect NOT feeling safe has on us. It’s not only physical safety we’re talking about, as in today’s sophisticated society insecurity manifests in many ways. Security in our job, security in our relationships, security in our investments. If you have any influence over someone’s sense of security, take the time to reassure them today if you’re able. It will make a vast difference to their well being.